NEUTROGENA Facial Cleansing Bar is pure and gentle cleansing for clean, clear, healthy-looking skin. NEUTROGENA Original Formula Facial Cleansing Bar is made with glycerin and other high-quality ingredients, so it is exceptionally clean-rinsing and won't leave any pore-clogging residue. Pure and gentle, it removes excess oil and its hypo-allergenic formula contains no harsh detergents, dyes or hardeners. Dermatologist-recommended cleansing for clean, clear, healthy-looking skin. I love using facial soap, makes my face feel clean, and doesn't dry out my skin either. This is the only soap that I have been using for over 20 years now and recommend it highly to those with sensitive skins. It is great for the body and face. Would not change for another brand of soap. This is my favourite soap and I love it. I use it on my face. It is the most sufficient product for my to wash my make-up before bed time without harming my skin. I absolutely love it. Best soap I have ever used, great for sensitive skin, rinses away easily. I love this soap, safe to use and not harsh. I'll continue using this. It is quite difficult to find this soap at any drug store around me, so I was happy to find them online and very reasonably priced! This soap is great and non-irritating and leaves my skin feeling very clean. I have combination skin and the only con about this soap would be that if I use it every day my skin tends to get a little tight and dry. I wash my face with it every other day, alternating with Spectro Gel in the shower and I have no complaints. I have been using this soap for my sensitive dry skin for more than 15 years. Excellent soap! I have been using this soap for years. Sometimes I find it hard to buy in stores, so when I saw it on Well.ca I was pleased. Been using this soap for a long time, can find it anywhere in store, well.ca is the only place I know that carries this. Really love the soap, doesn't dry up your skin like other facial wash. Introduced the soap to my mom and she loves it too. I am glad that well.ca carries it. This product comes highly recommended. Really like this soap! Great price and nice to use daily ( as I have sensitive skin) also leaves my face unbelievably clean! I love this soap, have been using it for years. I could not find it in stores anymore, thanks to you I have it again! I have always used this product. Extremely satisfactory. great product, cleans really well!! Possibly the best facial cleanser out there. I've tried so many products and nothing ever cleared my oily/acne prone face as quickly and gently as this. I rarely get blemishes now, so all I have to do now is find something to get rid of the acne scars I have. Fortunately and unfortunately, well.ca is the only place I've found that even sells this.. I have really sensitive skin and this soap is great. I have been using it for about 10 years. Love it! I have used this soap for about 5 years and find it to be great on my face where i require an oil free soap. I have been using this product for over 15 years and highly recommend using it to anyone having sensitive dry skin. Great soap, really good for sensitive skin and washes off easily. Have been using it for several years. My family and I have been using this product for over 10 years now and highly recommend using it to anyone having sensitive skin. This was recommended to me by my family doctor as I was having reactions from other soaps that I was using. I have not used any other soap ever since. Excellent soap for my combination/sensitive/acne prone skin. After 20 years of trying every cleanser under the sun, this one is passing with flying colors! Skin comes out squeaky clean and acne flare-ups clear up much faster. love the product, and love the convenience of shopping at well.ca! best soap ever!!! leaving your skin soft and silky like a water boiled egg. Jennifer Aniston owns a whole bunch of luxurious beauty products, and she uses this to wash her face. Lovely mild soap that has no perfumes. Soft and gentle to the skin. found no one locally was stocking it anymore because of price point. I buy this for my mother, she has very sensitive skin & there is not a lot she can use. She loves this soap on her face, does not bother her & makes her skin soft. Great product & will always buy. I have very sensitive acne-prone/eczema-prone skin and this soap works great for me. Not every product works well for everyone of course, but I recommend that anyone with skin sensitivities or battling eczema give it a try. I have been using Neutrogena for many years and will continue as it's easy on my skin - no sensitivity at all. I am glad that you are carrying this product. Many thanks. I discovered Neutrogena several decades ago. It was the only soap that appeared suitable for my sensitive (and prone to allergic reactions) skin. In recent years Neutrogena bars disappeared from local stores and I was glad to discover your company's excellent mail order service - for which my thanks. This is the best! I have very sensitive skin and this doesnt irriate it but it does remove all traces of makeup. I didn't really feel any difference when I started using this product. Now I've been using it for 3 weeks and I still don't feel the difference in my skin. I wanted to get rid of some blackheads in my nose by using this soap but it didn't work. Great product! Have used for years! Shipping was fast and free! Great for sensitive skin. Leaves no residue that can irritate. Nice to have a product stay the same without "improvments", for faithful users. There is a reason why many dermatologists recommend glycerin soap-especially this one. Draws moisture into the skin, yet it cleans so well at the same time. I have used this for over 20 years now and my skin is showing no signs of aging and I am 44!! Great for any age, simple, natural cleansing at its very best! A lifesaver for folks with sensitive skin, and it's cheaper than the liquid form. One bar lasts me a whole month which is a big savings. Excellent cleansing w/no residue. Helps cut down on break outs. Especially good after a work out or whenever you're quite dirty and sweaty. Wonderful product, really helps with getting healthy skin and no rashes now. Skin much better since began using this. Bought this for a gift and recipient was thrilled. Very efficient service, shipping and delivery. Like it a lot. Non drying like other bar soaps and haven't had mcuh acne. 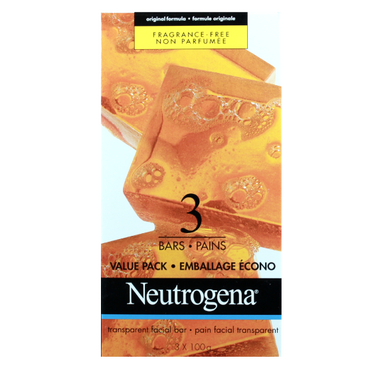 Neutrogena soap rinses off easily, does not irritate the skin and is great for sensitive skin. Also like that it is scent free. Fantastic product. Used to buy it from Loblaws but they stopped carrying it. Anyone with oily skin would appreciate this soap. It's better than any facial wash I've used. I absolutely love this soap...have been using it for over 40 years! It is most delicate on my face, cleans very well (even the make-up) and does not leave the skin feeling dry, just soft and subtle. It has no perfume or other nasty ingredient that is not particularly healthy. I do agree that it is now difficult to find and was overly ecstatic when I realized it was available through Well.ca. As a bonus, they offer a fast and efficient service. Thanks so much. A loyal fan!